Ono, Any chance to troubleshoot/fix the issue with older Macbooks and iMacs? Myself and a few others were unable to get the GPU going on those. Hardware supports OpenCL (NVIDIA GTX 775M). It crashes on kernel builds. I think these GPUs should work with the next build, we'll see. Much appreciated! 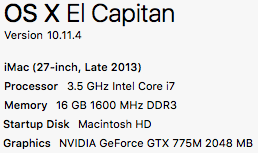 Any chance to troubleshoot/fix the issue with older Macbooks and iMacs? Myself and a few others were unable to get the GPU going on those. Hardware supports OpenCL (NVIDIA GTX 775M). It crashes on kernel builds. It's "com.glare-technologies.Indigo Renderer" from what I see. This changes nothing for me though. Still crashing on Building OpenCL Kernels. Crashes on "Building OpenCL kernels." Have you updated your drivers to the latest? Seems that way... unless I'm missing something. Nice! What's the render time on something like that? logo car is redesigned Nike logo? Topic: How do I get the window transparent ? Re: How do I get the window transparent ? I'm betting this model doesn't have realistic glass (with thickness). Assign Thin Glass material to it and it should work. See the attachment. Topic: help me... how can I animate a light? Re: help me... how can I animate a light? snorky wrote: I'm looking for a way to animate a lightsource (simple plane object) using the sketchup's scenes. Is it possible to do this with sketchup and skindigo? could someone write a step by step tutorial? What aspects are you trying to animate? Position? Intensity? Color? All?